Beirut: On Thursday government troops, with strong Russian air support, overran the Ban Zeid suburb of Aleppo, linking the war-torn city to its massive countryside, marking a strategic victory for Damascus and Moscow. They are now closer than ever before to retaking Aleppo, the former “industrial capital” of Syria, whose eastern part has been held by Turkish-backed rebels since 2012. If they succeed, it might be the endgame of the savage five-year conflict in Syria. The ancient city of Aleppo, once earmarked as capital of opposition-held Syria, is on the verge of falling in the hands of the Syrian Army. If it does, it would mean the collapse of the northern front and possible, an end to the war in Syria, currently, approaching its sixth year. The Riyadh-backed opposition is furious, accusing Turkish President Recep Tayyip Erdogan of abandoning them in metropolitan Aleppo and its countryside, while activists on the ground are firing accusations at the Syrian National Coalition, claiming that if its top leaders relocated to eastern Aleppo, which has been rebel-held since the summer of 2012, then a proper administration could have been established, with de facto recognition from the international community. Meanwhile, while the Syrians are trading accusations, top US and Russian diplomats discussed Aleppo at a summit in Laos on 26 July and the besieged city is expected to be a top item on the Turkish-Russian summit, scheduled for August 9 in St Petersburg. Having sidelined Turkish President Recep Tayyip Erdogan from the Aleppo battle, the Russians are taking full-control of the large operation in the Syrian north, both militarily and politically. Locked down in a witch-hunt against his opponents, Erdogan has neither the time nor the energy for Aleppo, and after patching up his relationship with his Russian counterpart, is seemingly willing to sacrifice his earlier ambitions of taking Aleppo for the sake of aborting the prospects of a Kurdish state on his borders with Syria. To please him, the Russians have refused to criticise the Turkish leader over the massive arrests that took place after the aborted coup attempt in mid-July, unlike the EU and US, both of whom have been very critical of their Turkish ally. The more they harangue him on human rights, the closer he inches towards Vladimir Putin. 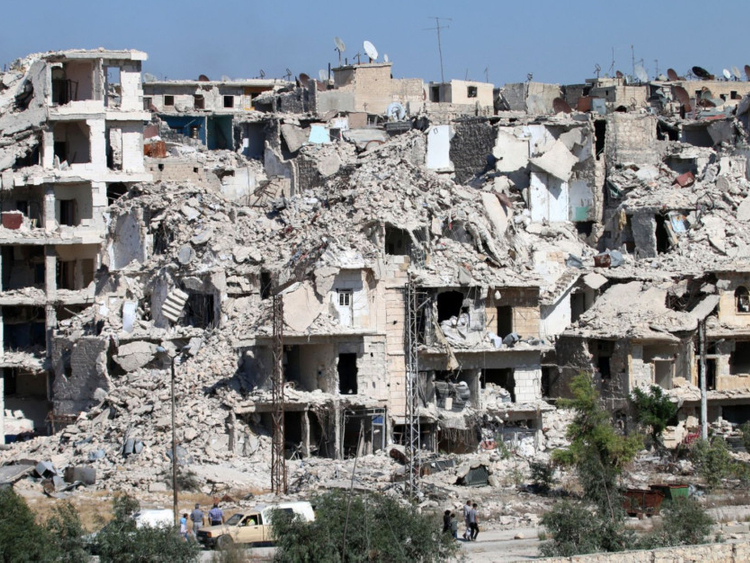 The encirclement of Aleppo, being Syria’s largest city and the third largest in the Middle East, was an extremely difficult task that began in mid-May and was only completed in late July. It couldn’t have happened had the Turks insisted on fighting for their proxies in Aleppo. For two years the Syrian Army had been trying to retake Aleppo but suffered from logistic difficulties, due to the non-stop flow of arms and fighters from Turkey, and lack of manpower. Thousands were conscripted into the Syrian Army for the task, and entire units were moved to the Syrian north to take part in the massive operation. Re-taking Aleppo by force would have involved guerrilla warfare and a street war, which would have triggered a massive death toll among government troops and Hezbollah fighters. It would have also damaged what remains of the ancient city, whose old quarters have already been destroyed, in addition to most of its eastern quarters. It was easier to encircle Aleppo and force its fighters to surrender or die. This has been a common tactic in the Syria War, carried out in the town of Zabadani in the Damascus countryside in 2015, and earlier, in the city of Homs in central Syria. In both cases, the rebels were allowed to leave with their arms and be escorted to the safety of rebel-held cities like Idlib in northwestern Syria and Deir Al Zor on the Euphrates River. The current encirclement only applies to rebel-held eastern Aleppo, which links the city to its war-torn countryside. The full encirclement of eastern Aleppo was only made possible through a series of operations that diverted rebel fire to Deir Al Zor and consecutive Russian-mandated ceasefires that enabled government forces to march on the city from all four corners. The war strategy for Aleppo was laid out by the Russian, Iranian, and Syrian defence ministers at a high profile meeting in Moscow on 10 June. Bashar Al Assad pledged to restore “every inch” of Syrian territory while his ally, Hezbollah chief Hassan Nasrallah said that Aleppo was the “strategic” battle of Syria, possibly its endgame as well. Last Thursday, Russian Defence Minister Sergei Shoigu announced the opening of three humanitarian corridors from besieged eastern Aleppo, where approximately 300,000 civilians reside. A fourth corridor was opened for the insurgents, he added, also under the watchful eye of the Russian Army. The statement was made by Moscow rather than Damascus, to give guarantees to the armed groups and assurances that they won’t be hunted down by Syrian authorities when they leave Aleppo. Minutes later, while Syrian and Russian television were broadcasting live the recapture of Bani Zaid, Al Assad issued a surprising amnesty, pardoning fighters who carried arms and wish to surrender in Aleppo. The two coordinated events were testimony to how closely Damascus and Moscow were working on Aleppo Operation. According to Lieutenant General Sergey Chvarkov, head of the Russian reconciliation centre in Syria, 169 civilians have used the corridors to get out, as well as 69 militants who surrendered their arms. Over the weekend, 52 civilians were evacuated from eastern Aleppo, along with 24 fighters. Apart from lip service from the State Department, the United States did nothing to prevent the Russian scheme for Aleppo. For his part, UN special envoy Staffan De Mistura said that he had not been informed of the Russian Defence Ministry plan for Aleppo. “We were not consulted” he said bluntly to journalists in Geneva on July 28. Regardless, Di Mistura hopes to jump-start Syrian peace-talks in Geneva on August 12. If the opposition loses Aleppo, they will probably boycott the talks, given that their negotiating position will be extremely weakened by battlefield setbacks.